Getting Your Read On: Giveaway, Review AND Author Interview! Marina has spent most of her life traveling the world with her scientist dad. Life has been good and Marina has no complaints until her father tells her she is going to stay with her aunt and attend a public school for the first time in her life while he leaves for a year to work on his own. Aptos, California is a beach town full of surfers and sunshine. Marina has no idea how this move will change her whole life. After nearly drowning, not once, but twice, Marina takes swimming and surfing lessons from Ethan, the hottest guy in town. Marina feels herself drawn to the ocean and to Ethan. One grounds her and makes her feel safe, the other torments her, even in her dreams. If you love paranormal romance with a bit of action thrown in, this could just be the book for you! If you love mermaid tales, this is a must read! I wouldn’t say I’m a paranormal romance junkie or a mermaid lover either, but I who doesn’t love a book that can pull you in and entertain you? That’s what this book was for me. It took me a bit to get into this book, but when I did, it was sure hard to pull me out. I didn’t want to stop reading. That is a very good thing. I’m so glad Derrolyn contacted me and asked me to read and review her books. Just when Marina thinks she has a handle on her mermaid life, she is thrown for another loop. Or two! An unfortunate accident forces Marina to expose herself as a mermaid and although she tries hard to keep the secret under wraps, the information leaks out to the evil forces who are conspiring against her. Secrets long kept begin to surface and Marina is caught in a web of lies and betrayal. As Marina feels her life spiraling out of control, she seeks comfort in the waves of the ocean. Surfing becomes an obsession, a need. Her connections to the mermaids increase bringing with it a greater awareness of her special abilities and powers. When Marina realizes the mermaids are in danger her instinct is to try to save them. But the attempt could just be the end of everything Marina has dreamed of. I was so happy to have the second book to delve right into after finishing the first book of this series. I found myself wanting to know what was going to happen next for Marina and Ethan and instant gratification should never be under-rated. J This book was a real page turner for me. It had romance, action and mystery. The twists and turns were fun, the characters engaging. I enjoyed getting to know the characters even more in this second book. I, personally, love the way Marina gets caught up in the feelings of the ocean while surfing. I just happened to be home, in CA while reading these books and we took a day trip to the beach. The sounds and smells that day really brought the book to life for me. I love the ocean but I would say I have a healthy respect (maybe a bit of fear, too) of its power and dangers. Unlike Marina, who was a part of the ocean and the world of mermaids. For me, Marina was a great balance of strength and weakness. I love her loyalty to those she cares about. Ethan is one of my favorite characters. He is strong and steady. His insecurities come out in this book, but it only made me enjoy him more. I love how he “grounds” Marina., keeps her steady and safe. He is a great character. I seriously cannot wait to read the next book in the series. (Here’s where the instant gratification thing isn’t working.) 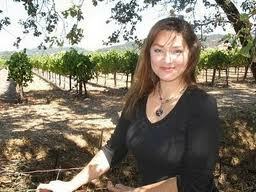 Derrolyn has done a fabulous job at creating a compelling, romantic story of mermaids and love. We are all so lucky today because Derrolyn has agreed to do a little interview and GIVEAWAY! How fabulous is that?! Derrolyn, thank you so much for letting me read your books and for doing this awesome giveaway. What was the inspiration for these books? Where did the idea start for you? I have three teenage daughters, and after reading some of their great YA fiction I was inspired to try my hand at creating my own stories. Outside of college essays, I’d never written very much, so it was a difficult challenge that rapidly morphed into something of an obsession! Now I can barely keep away from my laptop, and I find writing fiction to be one of the most satisfying things I’ve ever done. I spent the first ten years of my marriage living in the idyllic little seaside neighborhood in Aptos that the books take place in, and I wrote it very much as I remember it. It’s located within the ginormous Monterey Bay National Marine Sanctuary, so there’s an abundance of sea life, and I can imagine mermaids being right at home there. There really is a wrecked cement ship with a pier leading out to it! So many of the characters in your book surf. I loved the powerful need you created in Marina that drew her to the ocean to seek the thrill of the surf. Do you surf? I had so much fun dreaming up the extreme surfing scenes in book #2! Let me just say that I like to imagine I’m a lot better at many things than I truly am! You have some great characters in your books. Who was your favorite to write? That’s a tough one to answer. I have a soft spot for Abby and Cruz, and Aunt Evie is such an over the top fairy godmother-ish type it was great fun putting words into her mouth! I’m currently having a blast writing Shayla’s dialog in book #3 – big things in store for that girl! I worked nights as an airport hotel bartender while studying art, and I experienced enough characters in those days to keep me writing for years! I learned from your website that you are also an artist. You have done some incredible work. What made you want to change gears to writing? Thank you for the kind words! I can’t really say for sure what triggered me to start writing, but I’ve always been a “creative” type, both in the good and bad sense of the word. I have a home-based business that involves a whole lot of mindless assembly work, and I find that writing helps to keep my monkey-mind occupied! When can we expect the next book in the Marina’s Tales series? Soon I hope? I’ve plunged right in on the third installment of Marina’s tales, “The Fate Of The Muse”, and it’s coming along swimmingly! I hope to have it ready to launch by the end of August. So... enough with the bad oceanic puns, and back to writing! Derrolyn is so generously offering TWO sets of her TWO books to TWO lucky winners. I love it! These books are only available as ebooks (for now!) so keep that in mind when entering. To enter, leave a comment on this review telling me why you’d like to win, along with your email address so we can contact you if you do win. Winner will be sent coupon codes for Smashwords to download in the format of choice. Between Land and Sea is .99 cents! 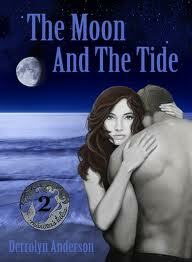 And The Moon and The Tide is 2.99! I enjoyed your interview. I have heard talk of mermaid books but have not read any yet. I think I will check out this series now. I have read a few mermaid books lately, but they have been lacking. This one sounds really great, and I'd love to read it! I too haven't read too many mermaid books but they have always fascinated me. This story looks wonderful, thank you for sharing! Thanks for the giveaway. I would love to win as they both sound so interesting. Why I would like to win? Recently, all I hear about YA literature, and paranormal literature in general, involves vampires, witches, ghosts and zombies (some Faeries are thrown in the mix, on occasion). It is really tiring and feels slightly unimaginative. It would be a nice change to read about something different. Besides, I always had an affinity to Mermaids - it is my favorite fairy tale, and part of my 12th birthday's gift was going to see the statue in Denmark. I'd love to win these books, I've seen a few other bloggers review the first book and they make me want to read them more! I love paranormal romance books and I would really like to read something different except of vampires, wolves etc, something more magic like mermaids. I think mermaids are the most beautiful paranormal creatures. Marina’s Tales series sounds great!